How to limit results to selected fields? Apply a Rule versus a Group? How to use AND/OR operators? How to save changes as a separate View? How to add Derived Fields to a Dataset's Result set? How to compare Dataset date fields to Snapshot (historical) dates? You can limit the display of Dataset's All Data only to those fields that are required for your data analysis. Just select the fields you need in the Select Fields section, click Apply Changes in the right side of the screen and the Result set is going to be updated and only those columns that you have selected are going to be displayed. 2. [Version 5.0.5 and further] How to add Derived Fields to Dataset's Result set? Derived fields include values that do not exist in a Data Source itself but are calculated from one or more existing numeric fields via basic arithmetic expressions and non-aggregate numeric functions. In addition to selecting specific fields, you can filter data using custom conditions. 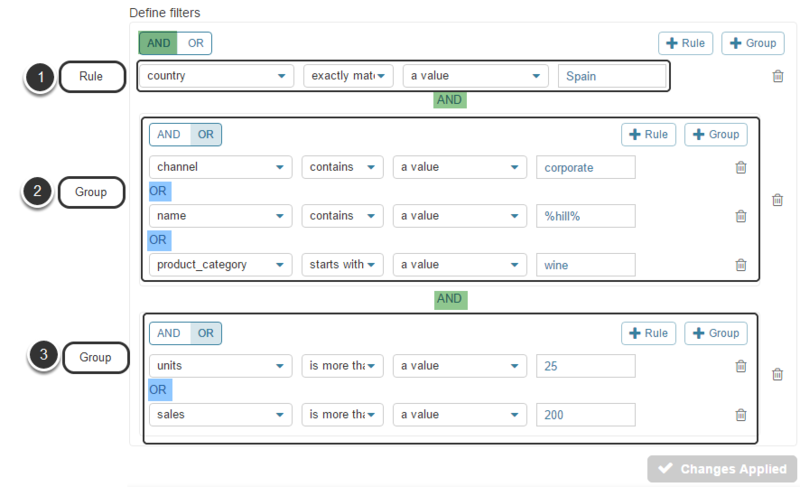 The process of creating a filter is similar to constructing a sentence: you choose a subject, comparison conditions and the values which are going to serve as a reference for filtering. For text columns: exactly matches, contains, is in list, is not empty, does not equal, starts with. For integer columns: equals, is more than, is more than or equal to, is less than, is less than or equal to, does not equal. 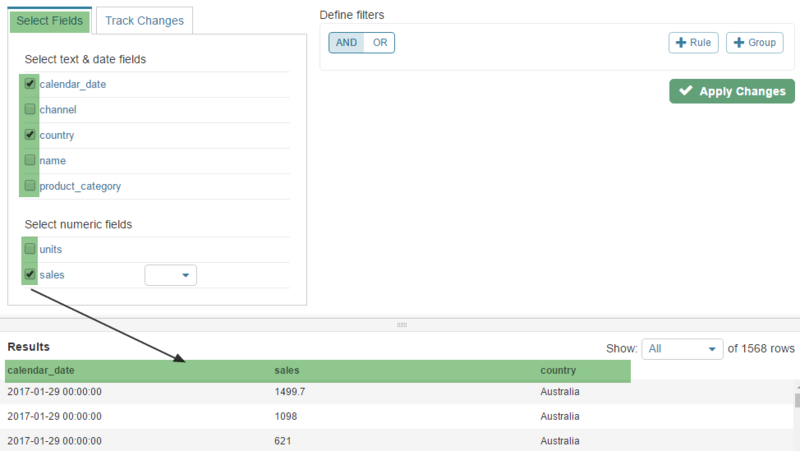 You can use filters to seed out the required information using conditional filtering. You may mix and match several simple Rules or compound filters (Groups) as defined in Create a Dataset View aggregated via [ AND / OR ] operators to focus on a highly specific data slice. The Results set will be displayed right on the same page. When you're using multiple Rules and Groups of conditions, you can use an AND / OR switches. You can not mix and match AND / OR for the set of applied filters but if you add a group of conditions, you may apply an alternative operator to it. AND We return all rows that match ALL of the filters. OR We return all rows that match ANY of the filters. 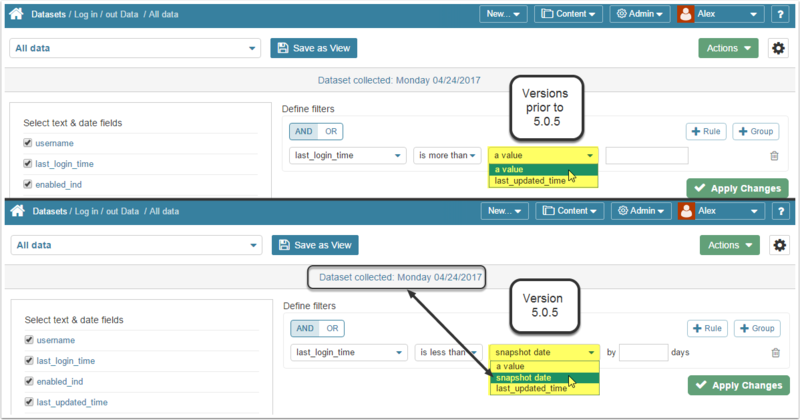 In Versions prior to 5.0.5 date comparisons could be performed to a constant or if there is more than one date field in a Data Source - to other date fields. In version 5.0.5 a new comparison option has been added - snapshot date. Snapshot date is the date when the Dataset has been collected or updated. Multi-Instance (Snapshot dataset): keeps history of Data updates. User can filter on a date field by comparing the field to the dataset effective date for a single instance or multi-instance dataset. You can compare the data from the current period to the prior period to highlight changes. For more details refer to this article: Snapshot Datasets: Comparing Instances. 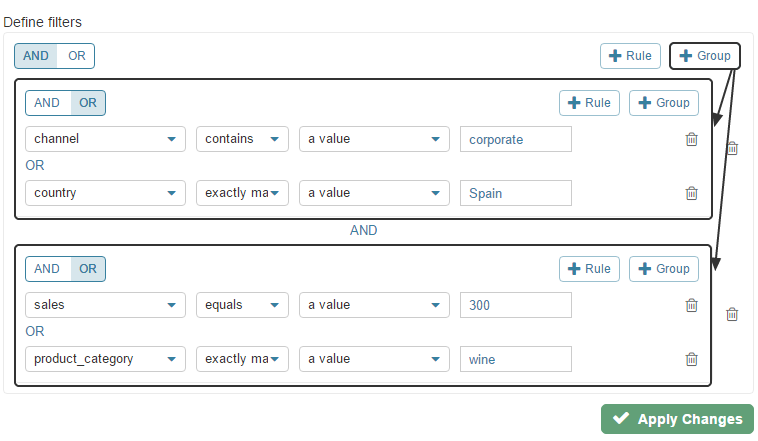 Dataset Views can serve to quickly create Reports / Metrics. Refer to Create a Report from a Dataset View or Create a Metric from a Dataset View for more details.